Health Secretary Dr. Eric Tayag revealed in an interview that they suggested including e-cigarettes and vaporizers on a planned executive order for public smoking ban. The Department of Health is still waiting for President Duterte’s approval to the Republic Act 9211 even though the restriction for e-cigarettes is not yet included. According to him, these handheld electronic devices may be safer than tobacco cigarettes but there’s a possibility that it can still damage someone’s health. The fluid in e-cigarettes called e-liquid has nicotine, glycerine, propylene glycol and flavorings that can also be harmful. A vaporizer on the other hand is a device that can vaporize on the same level of combustion like tobacco leaves For some people who want to quit smoking, they use it as an alternative however it becomes a portal to conventional smoking. The Health Secretary also added that many e-cigarette manufacturers in the country reacted to the department’s decision but reiterated that they are not stopping them to produce their products. Curbing smoking is popular worldwide that’s why it was one of their business venture. The draft for the executive order has 2 provisions; all smoking areas must be outdoors and 100% smoke-free surroundings. Netizens who knew this were mostly positive if this law will implement. 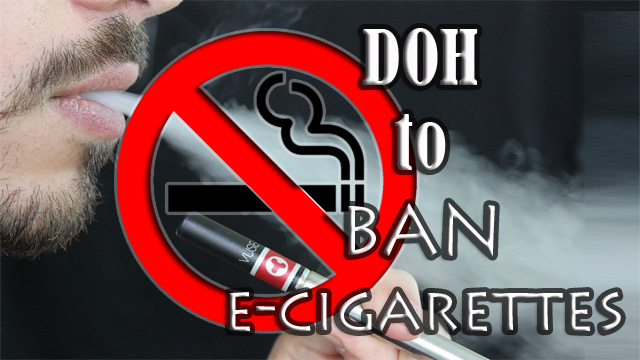 For Metal Melter, he is hoping that DOH will be successful in banning e-cigarettes in public places. Let the smokers stay on their designated smoking areas where they could emit all they want. Meanwhile, Penance told him that he might misunderstood that the ban is in all places. The vape smoke for him was just a water vapor and it won’t harm you anyway. Deadswitch on the other hand believed that banning is good but not that effective. He suggested putting higher tax to these devices so that it will be hard for them to purchase.